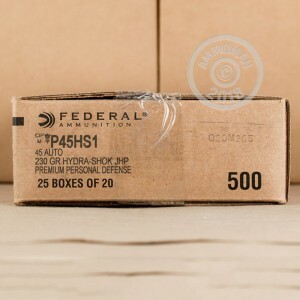 Federal Hydra-Shok ammo is considered by many to be some of the most effective self-defense ammo on the market. It has been on the market for decades, and has been carried by civilians and law enforcement officers everywhere. This ammo has a jacketed hollow point projectile with a post in the center of the hollow point. This post, with the copper jacket and lead core, are designed to produce reliable expansion even when fired through intermediate barriers such as denim. This round was also designed to have about 15 inches of penetration, and to expand to roughly twice its original size. 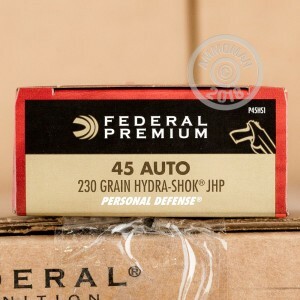 This makes the 45 ACP Federal Hydra-Shok round highly effective as a self-defense round. 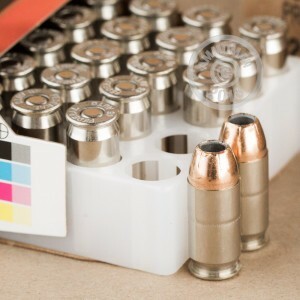 Each one of these rounds has a re-loadable brass case, is non-corrosive, and is boxer primed. Buy in bulk today and save money with free shipping!